Swindon News - November 27, 2017 - Comments Off on Olympic star turns on Old Town lights. 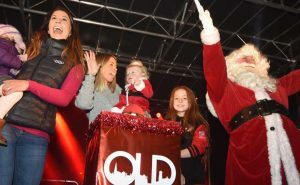 Olympic star turns on Old Town lights. Calyx News, Wiltshire News - July 26, 2016 - Comments Off on Wiltshire sports stars Shelley Rudman and Lauren Booth become Air Ambulance Ambassadors. Wiltshire sports stars Shelley Rudman and Lauren Booth become Air Ambulance Ambassadors.